High Spirits is an independent Community Choir, founded by Music Director Ieva Wool, and based in central Vancouver. We sing an eclectic, uplifting and sometimes demanding repertoire from renaissance to modern, from classical to jazz and anything in between. We perform two major concerts each year, one in January and one in June. Our concerts are heart-warming and memorable events which sometimes include a few sing-along songs with the audience. High Spirits is also an outreach choir, singing for people who normally don't get the opportunity to hear live music. For instance, we perform at retirement homes, seniors centres, hospices, and community events. Every December High Spirits also holds a Christmas Sing-Along to benefit the Lookout Society. 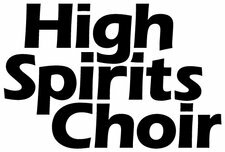 New singers are invited to join High Spirits in September and February of each year.